What is the “Right Budget” for Parks? Please join us to discuss how we respond to the direction from Mayor Wheeler to reduce Portland Parks & Recreation's operating budget by 5% or $3.27 million. Click here to view the excellent Oregon Experience video about Vanport and how our neighborhood flooded in 1948. The Rose Garden is turning 100 years old – 1917-2017. In the City of Roses, that means it's time for neighbors and friends to celebrate, and all are invited! Kickoff ceremony – 11:00AM in the Royal Rosarian Garden – with City Commissioner Eudaly. Free Cupcakes – for the first 500 guests, following the 11:00AM kickoff. Art among the roses – Youth Art Gallery – Students from across the Portland Public School system have created art that celebrates roses, city-scapes, and Portland. Garden tours – hourly from noon-5:00PM, meet near the Rose Garden Store. Rose finder and discovery guide – follow the map and find the flags that identify special varieties of roses, and learn what makes them unique. Music in the roses – Stroll the garden and find local musicians playing tunes to entertain you. Painting station and Rose crafts – where adults and kids can get their own art on. Rose ice tea samples – in the Shakespeare Garden. Rose ice cream – developed especially for this event by Salt & Straw. Over the years – a historic display of the garden. Rose temporary tattoos – a beautiful reminder of the day. Food vendors – plenty to eat and drink so you can wander the garden and enjoy. Ribbon cutting – 6:00PM in the Royal Rosarian Garden – City Commissioner Fritz will lead a celebratory ribbon cutting honoring completion of the ADA accessibility project, funded by the voter-approved Parks Replacement Bond. Concert in the Rose Garden Amphiteater – we are combining this event with the Washington Park Summer Festival and have a free concert scheduled for 6:30PM with Pilón d’Azucar (Cuban salsa, timba, Afro-Cuban jazz). Please read the info graphic below for travel tips on getting to the event. 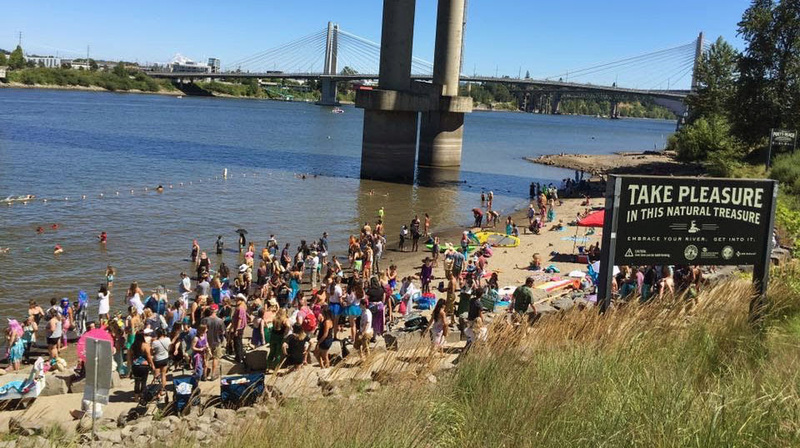 The new Poet’s Beach on the Willamette River is open daily and a great way to cool off in the heat. This week it is predicted Portland will experience a major heatwave. Temperatures are expected to reach triple digits and remain high for several days. Prepare yourself and family for the hot temperatures that are predicted. Check in on your neighbors and loved ones. Elderly persons, small children, and those with chronic health issues are particularly susceptible to heat reactions. Multnomah County’s “help for when it’s hot” website provides guidance on how to take care of yourself and others during this heatwave and has a list of cooling centers, their amenities and operational hours (starting today, August 1). 211 Info provides up-to-date information on available relief centers, shelter and services, including transportation. There are spaces throughout the city that can provide relief in these extreme temperatures. Residents who do not have access to cool places are encouraged to visit the locations below to avoid the heat. Cooling centers will open Tuesday, Aug. 1 and remain open through at least Monday, Aug. 7 at the locations listed below. All cooling centers will be open from 5 p.m. to 8 p.m. on weekdays and 2 p.m. to 8 p.m. on weekends. Pets and children are welcome at these cooling center locations. Snacks and water are also available. Call Multnomah County Aging and Disability Services at 503-988-3646 for more information. Transportation to these cooling centers can be arranged by calling Ride Connection at 503-226-0700. Advance reservations are encouraged. All rides are free of charge. How can we best provide trees for everyone? Share your opinions about tree planting in this short survey that closes July 5. Portland Parks & Recreation's Urban Forestry is partnering with community members, stakeholders, and Portland State University to identify the best ways to expand tree canopy access for all residents. Feedback from this short survey will help us understand opportunities and barriers to tree planting in our communities. Learn more about the Citywide Tree Planting Strategy at Branch Out PDX.